We are St. Louis Wildlife, Inc. a full-service wildlife removal company servicing the greater Saint Louis MO area. We resolve conflicts with unwanted raccoons. When Can You Solve My Raccoon Problem? Common problems caused by raccoon include: living in an attic, tipping garbage cans, and all sorts of general destruction and mischief. 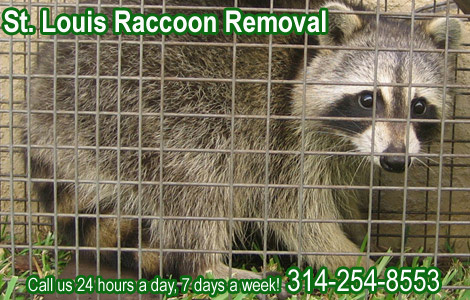 Our company specializes in wild animal control, including St. Louis raccoon removal. We are not a pest control company, or an exterminator. We deal strictly with wild animals. We are also not the Saint Louis county animal control, and we do charge for our services. You can read more about Missouri Raccoon Information & Biology here. How to remove raccoon from chimney - A raccoon likes to live in a chimney because of how similar it is to a hollow tree. In most chimneys, a raccoon will have no trouble climbing up and down the shaft interior. This scenario is most likely to happen when a female raccoon wants to have her litter in a warm, safe place. A female raccoon is the usual culprit behind a home invasion, though occasionally a lone male will seize the opportunity to live inside of a home. Either way, getting a raccoon out of the chimney is a little easier than getting one out of the attic or crawlspace. First, do not start a fire. Not only does this risk having the raccoon enter your home through the damper, any babies sitting on top of the valve will be subjected to a long, painful death. The best way to handle a racoon in the chimney is to attach a special cage trap to the top of the flu and scare the adult out of the shaft. Once the adult is contained at the top of the flu, you can reach around the damper and pull down any babies. Of course, remember to wait until the adult is gone before trying to get the young. This is one situation where you can’t see what you’re reaching into, and it puts you at risk of a nasty bite. How to remove a raccoon from the attic - Where there is one raccoon in the attic, there is usually more. This doesn’t mean you’re going to find multiple adult raccoons, but you may very well stumble on a batch of babies. Female raccoons are usually the guilty parties when it comes to living in an attic, and this is because pregnant females are trying to evade males. A male raccoon won’t kill his own young, but he will kill the young of other makes, making the first few months of life very difficult for a raccoon kit. A human home offers the protection a mother raccoon is looking for. Trapping this adult can be easy if you manage to find the babies and remove them while she is out of the house. If you have the kits, you can put them in a cage trap to lure the mother. If the litter is well-hidden and things aren’t looking up for you, you’ll have to place the cage trap on the ground or bolt it to the roof of your house. You want to make sure it’s in the path of travel for the adult critter. Bait it with some bread or marshmallows and wait.